Do you like a Chicken dish at a restaurant but unable to recreate that restaurant like taste at home? 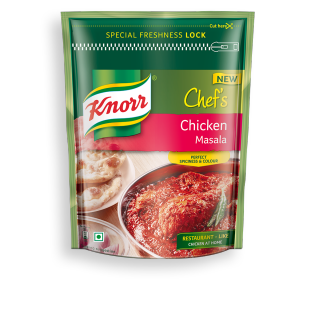 Knorr Chef’s Chicken Masala is specially made for a discerning chicken lover like you. The right hint of spiciness packed with mouth-watering flavours will make you ask for another serving. This Chicken Masala gives your home cooked chicken the restaurant-like taste with the perfect spiciness & colour. What's in our Chicken Masala? 1. Cook Restaurant-like Chicken at Home 2. Made by Knorr Chefs 3. With 'Special Freshness Lock'- Keeps your spices fresh for longer 4. For Perfect Spiciness & Colour 5. With Knorr Chefs Masalas, you are the Master Chef of your kitchen 6. Chef's Tip: Garnish with chopped coriander leaves and green chilies. Serve hot with Rice or Roti. 1) In a Deep pan, fry chopped onions in the oil till golden brown. Add chopped tomatoes, ginger-garlic paste, coriander Powder, red chilli powder, turmeric powder and salt. Cook on low flame till oil separates. 2) Add pre-cut chicken pieces into the onion tomato masala cover with a lid and cook on low flame for 15 minutes. 3) Add 1 Cup (150 ml) water along with 2 tbsp (16 g) Knorr Chefs Chicken Masala , mix well, bring to boil, cover and cook till the chicken is done. Serve Hot!